2002 wasn't so good for me. Lots of family tragedies, the height of the second Intifadah, bombs in the streets, economic depression. Not a happy time, you'll all recall. But in the midst of all that, the wine bug bit me. Meanwhile, Bordeaux was struggling, too, with the weather uneven and on the cool side (the Reader's Digest weather report). Bordeaux had suffered a decent share awful to mediocre vintages throughout the 90's, just about batting .500, and I can imagine that contributed to a "once bitter, twice shy" attitude in the public consumer's mind. Combine that with anti-French feeling in the US (by then the biggest market in the world) when the en premieur campaign was taking off, plus the big shadow that 2000 was casting, and you have a vintage that no one at the time cared much about. Ten years later, it's still being overlooked. I don't think our kind hosts were dead set on re-educating the lot of this evening, but they wound up opening quite a few eyes, I think. Certainly the wines they shared with us got my attention, and I'm grateful for their amazing generosity. The first three wines were served blind in a sort of calibration flight, three different vintages of St. Julien 4me Cru Brainaire-Ducru. They were served blind and more or less fit in with my expectations of the vintages. 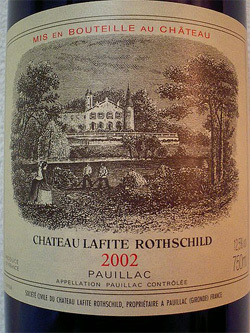 The 2001 is elegant and the most reserved, despite its soft tannins. The 2002 is more tannic and minerally, and, of the trio, develops the most in glass. The 2003 is the ripest and most modern. With our palates as much in synch as possible, we proceeded to the 02's. Enticing fruit that is warm and rich on the palate without being overdone, ending in a mineral finish. A lovely wine, and while it might lack dimension and is a little too rich, 90% of the Bordeaux wannabes around the world can only dream of being like this. This is a more expressive, even 'serious', nose, with notes of sweat and tapenade. A classic claret. The nose is simply overwhelming with sheer hedonistic style. The palate is more austere, but well balanced. Ye Gods, if the Malescot was a classic claret, this is the Platonic ideal. A complex, well-made, delicious wine that is very Cabernet Sauvignon in character, with its spicy currant fruit. Yummy. Less extravagant than the Margaux, but no less poised and balanced. I admit I don't have the sleuthing abilities to search for the fruit that is MIA behind the curtain of oak. Maybe a case of time will tell? The disappointment of the evening. There is oak here as well, but enough muscular, brawny black fruit to pound at the oak and hint at a promising future. Obviously high class but not as high as the Margaux, Leoville or the Cos. Nor as high as the following two wines. This has the extravagant allure of the Margaux, but different in character, defined as it is by an intoxicating, earthy vein with spicy/meaty overtones. The magic is sweeping, and so is the balance and power. The most complete wine of the evening. Closed on the nose at first, but on the palate, the savory tannins are refined enough to carry the wine even now. Actually, after some time in glass, the nose also shows the wine's complex greatness. Perhaps the most powerful of the First Growths of the evening, but right now it is also the most reticent. Less overwhelming and more to my tastes than more renowned vintages. I think that the intrinsic value of such a tasting (let alone good food and outstanding friendly participants) is to derive conclusions which may help in defining and evaluating the even years that followed (2004, 2006, 2008). Most of us are led astray by certain critics connected to the industry and tend to ignore the overshadowed years such as 2002 in favour of the hyped glamorous years. In doing so, we fail to take advantage of the bounty of outstanding wines either from lesser pedigree or modest years. I agree and I stocked up on a lot of 08's (in the context of a 300+ collection). The problem was 2002 wasn't just under-hyped, it was derided!